Published May 5, 2014 by Addison-Wesley Professional. Part of the LiveLessons series. Apache Hadoop YARN Fundamentals LiveLessons is the first complete video training course on the basics of Apache Hadoop version 2 with YARN. The tutorial begins with MapReduce and Big Data fundamentals and moves to YARN design, installation (laptop, cluster, and cloud), administration, running applications (MapReduce2, Pig and Hive), writing new applications, and useful frameworks. Additional coverage of Ambari, Ganglia, Nagios and the Hortonworks HDP is provided. Douglas Eadline is the instructor for this essential Big Data LiveLessons. Eadline is a practitioner and writer in the Linux Cluster community and previously authored Hadoop Fundamentals LiveLessons which focused on many of the basic aspects of Hadoop processing. Eadline is a co-author of the companion book Apache Hadoop YARN, Moving Beyond MapReduce and Batch Processing with Apache Hadoop 2. Doug provides a clear and complete introduction to many of the important Apache Hadoop YARN tasks and topics. In addition to a sound background on Hadoop design, he provides several installation scenarios including a laptop, cluster, and cloud. The Ambari graphic installation tool is explained and used for both installation and administration. You will also learn how to write your own YARN applications and what is needed to run Hadoop version 1 applications. Some familiarity with Java, Hadoop MapReduce and the Hadoop Distributed File System is helpful but not necessary. All example code and Lesson notes are available for download. Technical decision makers and Apache Hadoop practitioners needing to understand the details and impact of YARN in Apache Hadoop 2. Apache Hadoop 2 administrator and those in operations who are responsible for running existing and new workloads on Apache Hadoop 2. Developers who needs to understand the features and facilities of YARN in Apache Hadoop 2. This set of videos provides a blueprint on how to port an existing application to run on YARN in Apache Hadoop 2.
understanding of Apache Hadoop 1 or 2. Experience using Apache Hadoop 1 is recommended. Strong Linux adminstration skills. Should be comfortable installing and configuring Linux, installation and configuration of add on packages and general Linux administration for installation sections. Understanding of and experience with common open source development tools needed for application development section. Apache Hadoop version 1 has become a popular tool for working with big data. One of the limitations of Hadoop, however, has been the single MapReduce computational paradigm. Apache Hadoop YARN addresses this and other issues. In this lesson you learn the fundamental differences between Hadoop version 1 and Hadoop 2 with YARN and the five clear advantages of the new YARN design. A production Hadoop installation, whether it be a local cluster or in the cloud, can be difficult to configure and costly to operate. This lesson presents several installation scenarios including a single laptop, a desktop, a small cluster, and the Cloud. Both Apache Hadoop source and the Hortonworks HDP Sandbox are used for local systems, and when installing in the Cloud, Apache Whirr is demonstrated. These environments can be used to try most of the examples in this tutorial. Apache Hadoop YARN introduces new components to the Hadoop ecosystem. In this lesson an explanation of what each of these components does and how they interact with each other is clearly presented. In addition, various YARN scheduler options and acomplete application life cycle walk through are explained. Installing Hadoop is not as hard as it used to be. In this lesson, both shell script and graphical installation methods are described. The graphics installation employs the new open source Ambari tool. In addition, a the steps to install and configure the Ganglia and Nagios cluster monitoring tools are provided. 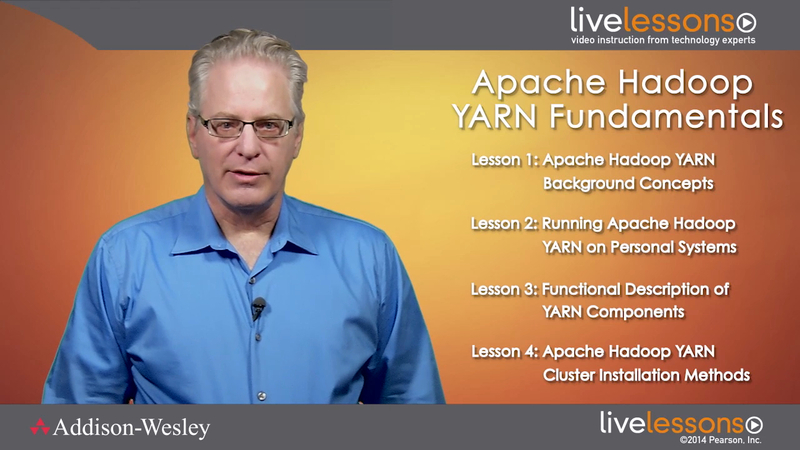 In this Lesson, monitoring and administering an Apache Hadoop YARN cluster are described. Similar to the installation lesson, both shell scripts and the Ambari GUI tool are presented. Several essential administration tips for Apache Hadoop YARN are also provided. One of the successful goals of Hadoop version 2 was compatibility with version 1 applications. In this Lesson, the new MapReduce framework that runs under YARN is explained. Almost all existing applications are compatible, and any important differences are presented. In addition, job tracking using the new YARN web GUI is demonstrated. Apache Hadoop YARN includes an application called distributed shell that enables shell commands to be run within YARN Containers on cluster nodes. In this lesson, a distributed shell example is presented and then expanded into a blueprint for other YARN applications. The Apache Hadoop YARN architecture enables non-MapReduce applications to operate on Hadoop clusters. This capability has spawned a new set of applications that can take advantage Hadoop's big data capabilities. In this lesson, some of these application frameworks and how they differ from MapReduce processing are introduced.